This entry was posted in Waste less recipes and tagged chutney, eating green, food, hot, Indian cuisine, Serrano pepper, sour, sustainable living, sweet, Waste less recipes, wasted food, watermelon, watermelon rind by Jean-François. Bookmark the permalink. My pleasure — thanks for sharing your story. Wow like the recipe, maybe Livvey and I could make a video of us making it. Looks like fun. The only part I am not crazy about is all the sugar. Do you think it would sweeten up enough if we used some of the watermelon? The nice thing about chutney is that there’s a lot of room to play. If you want a sweet chutney, you could use watermelon juice or another juice instead of water or use more dried fruit — alternatively, you could just make this less sweet and kick up the spiciness with more ginger or chilies, or the sourness with lime. Let me know how it works out, and if you make that video. I’ve never tried those — but watermelon rind pickles sound really interesting (slightly spicy ones, perhaps). Will have to experiment with the next watermelon. This is so cool! I actually really like the white bit after having the pink bit – it’s almost a bit of a palate cleanser! My Dad goes a bit far by julienning the rinds with the dark green bits still on though and putting them in stir fries. LOVE the concept of this blog by the way. I have found a stallholder at my local market who sells broccoli with the leaves still attached to the stem. Apparently they are actually healthier, yet most people never get to eat them. The stalks are pretty tough but the leaves are just like kale. Thanks, Zo — I’m guessing your father juliennes those rinds pretty finely, or has really strong teeth. Still, I do like that stir fry idea. 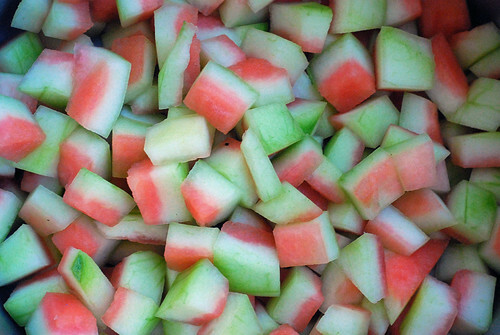 Looks like we’ll be eating a lot of watermelon this summer, so I can try all these things out. Broccoli rarely passes out threshold, thanks to the fact that several people at Bonnie Lee’s office were on some kind of long term broccoli diet, and she developed a serious aversion to the smell of it cooking. If she ever gets over that, will look for the ones with leaves. 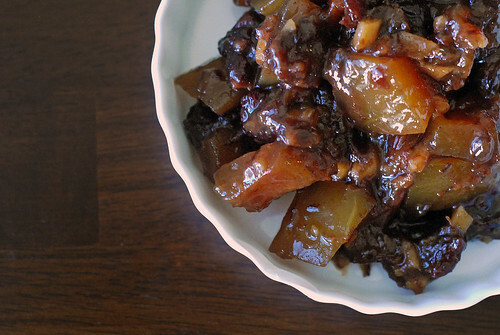 I’m really loving the texture and subtle flavor of the rinds in the chutney, and will be trying other things with them … but when they’re in season next time. The watermelon was so cheap ($3.99) that I assumed it was, but your comment made me check. Time to start paying more attention to that. ..eat all red flesh, remove green skin and take only white parts. cut them 3-5cm long and slice very thinnly. just use them in any salad in the place you need cucumber. or make their own salad. That sounds like a great salad. The rind is cool and crisp and balances nicely with heat. Ooo what another great idea for using watermelon rind! thanks for sharing! you need some sugar or honey for the sauce(or dressing).